The first time I did makeup for a client, I had never used false eyelashes before. I didn't mention that - I just put them on her. The first time I photographed a woman much older than me, I felt intimidated. I worried she'd think I was too young and not take me seriously, but I never told her that. I just used my knowledge and directed her and made her feel special. The first time I filed for a business license I googled "how to get a business license." After half an hour of reading and feeling like I understood how, I realized I was reading information for Ohio. I felt ridiculous. So I googled "how to get a business license in Missouri." I followed the directions, and I got the license. The first time I went to a networking event I sat in the car for half an hour and talked myself out of driving back home. I rehearsed conversation topics and double and triple checked my business card stock in my purse. I finally walked in, terrified. But I smiled and met a few people and had a good time. I booked future clients and met future friends. The first time I won an award for a portrait, I had created a portrait that I had felt in my heart. I saw a stranger one day at church, and her beauty inspired me. I eventually just asked if I could photograph her, and I photographed her with the vision I'd seen in my mind's eye. I didn't have a studio - just a duplex - and I had to move the kitchen table and photograph her in the living room. I poured my heart into it, didn't question my abilities, and in the end it was a success. I say all this because I know some of you out there are dreaming big dreams and then telling yourself why you can't achieve them. I did it for a long time. I still do it. Maybe you've told yourself no for so long, you don't even remember what you once dreamed of. I have my dream job and so much of that achievement is simply showing up and then getting back up when I fall. Do I feel ready? Rarely. Do I feel prepared? Never. But I show up and I do my best. You're right - you're not perfect. And what you have to say/write/create probably has, in some way, "been done before." But not the way you can do it. Because YOU are the only you there ever has been (or ever will be). If you are interested in experiencing a portrait session with me, please fill out the contact form here and I'll reply with all the information! Currently we have two sessions available for September, and three left for October. She walked up to the wall of portraits in my studio. She pointed to one, a confident red-haired mother of two, with a black lace bodysuit stretched across pink lingerie. "I couldn't wear that," she said, definitively. So I looked her in the eyes, knowing she wouldn't point to an outfit that way if she didn't want to wear something like it, and asked, "Why not?" "I can't wear that." WHY NOT? "I can't try that." WHY NOT? "I can't achieve that." WHY NOT? "I can't be that." WHY. THE. HELL. NOT? And my client who stared at the wall of portraits - I asked her WHY NOT and she rose up to the question. She was honest with me about the way she hated her appearance, and we talked and laughed and nodded with understanding. We're both women who have lived for decades in a society that consistently tells us we're not enough. And I told her about all the amazing things she could wear, I told her about the beauty I saw in her the first time we met. I told her I couldn't wait to capture her beautiful soul on film. And by the end of our meeting, she'd planned her dream photoshoot. Before my very eyes she embraced the WHY NOT, and it was beautiful. A few years ago I got tired of living by other people's limitations. Now I ask WHY NOT and usually the reason is laughable. So instead of cowering, I do the thing - I take the challenge - I dive right in. And it's always worth it. Send me a message at www.mitzistarkweather.com/luxe-portraits for information and booking. 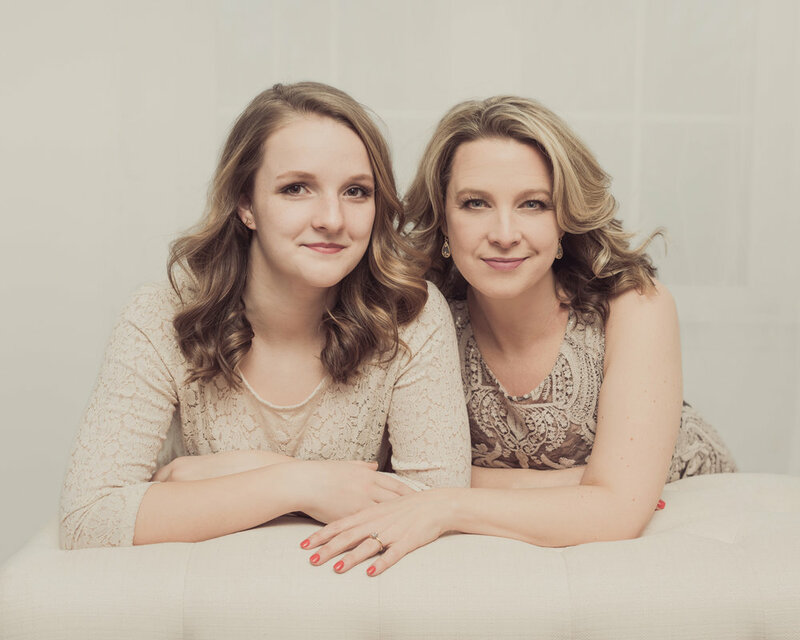 When Channing scheduled her Girls Day Out Luxe Portrait shoot at our new Downtown Joplin studio, we sat down to plan the details. She chose to bring her mom and sister and since her wedding is coming up, at first I was surprised she didn't choose to bring her friends or bridesmaids - but she told me that since she's from a big family, they don't have many professional portraits of just the women. How beautiful, I thought. One of the best parts about shoots where one woman brings others along is that usually these other women wouldn't have thought to book the shoot themselves. Maybe they don't think they'll photograph well, don't know what to wear, feel nervous in front of the camera... I hear all the reasons, but continually I'm blown away at how amazing those same women feel when they step out of their comfort zone. 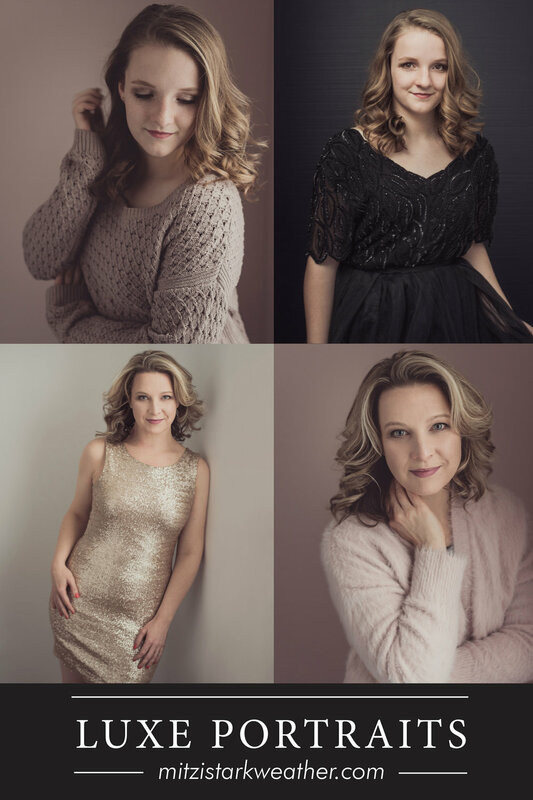 Channing, her mom Patty and her younger sister Miranda had a magical day in our studio with Frosted Cakerie treats, pampering by hair and makeup artists Chloe Bartlett and Natalie DeMint, and a beautiful photoshoot with me. When they came to their portrait reveal yesterday, they were in awe of what they saw. I think sometimes we just know ourselves too well. We think about every bad photo we've been in, how much better our figure could look or has looked, the time someone said we weren't ___________ enough. We've seen our own worst so we forget what our best looks like. I love when a woman walks into my studio - Do you know what I see first? The things that I think are most beautiful about her. Her smile, her eyes, her hair, the way her nose wrinkles when she laughs. I start to plan a "transformation" for her with outfit plans and hair and makeup artists... And then it happens. She transforms like a blooming flower. The best part is that her beauty was there all along - the rest of us just led her to a place where she could finally see it. And Channing: As you enter this transformative season of life with your upcoming wedding, I hope you'll cherish this day with these women you love and remember how lovely you felt in that pink tulle gown. And please - remain in awe of the woman you see in your portraits. If you'd like to learn more about the Luxe Portrait experience, reach out at www.mitzistarkweather.com/luxe-portraits and I'll send you all the information! I packed up armfuls of dresses and skirts from the white wardrobe. Tulle and sequins spilled out of boxes and bags as I hauled them to the car and then up the stairs to the new studio. And then I went back for another load, the tenth task of the day during three weeks of 15 hour work days. As I walked back down the hallway, a noise caught me off guard: the echo of my own footsteps in the old studio, the one we'd created out of two bedrooms in our 1600 square foot home. It was suddenly so empty, and that beautiful light from the extra tall window still glowed all around. I didn't think "good riddance." I didn't scoff at these humble beginnings and feel relieved to finally have a Downtown studio space. Surprisingly, I started to cry. So I sat down. I thought about the women who'd had their hair and makeup done in that room. I remembered how thrilled I'd been about "all the space" when we bought our new house. I thought about the nervous souls that entered and how they seemed to float away when they left. The emotions were wonderful and overwhelming. What a beautiful space for a beautiful time. I learned more about my clients, my craft, my passion, and myself during those two years than I can even express. I will always honor the time I ran a portrait studio from my home, because now I see how necessary this step was for myself and my business. It's easy to get stuck in the past or the future. "Remember when..." or "Someday..." Both ideas are okay in moderation, but I think we do ourselves a huge disservice when we live in one or the other. I want to live in what is now, and honor what is now. I want to honor the few minutes it takes to brew a coffee the way I honor the few minutes it takes to exchange wedding vows, and honor the act of chopping red peppers for dinner the way I honor writing a birthday card to a close friend. It's mindfulness and it's gratefulness. It's so easy and so difficult. I can be so afraid of making mistakes. And at my most insecure, I take this obsession a step further: being afraid not just of messing up, but of not outdoing my past self at every turn. Anyone else feel that way? Like they're not enough? That their mistakes are stubbed toes rather than valuable lessons? I'm trying to honor my mistakes. I sit in them. I explore the feelings around them, I listen to counsel, and I get up and try again. Exchanging shame for honor - now that is beautifully upsetting (in the best way). And when it comes to mental health, rather than be annoyed when I cannot control my anxiety or depression or "off" days, I honor them. I no longer demonize my body and mind for being imperfect - I recognize and care for them. My sick days are just as important as my most productive days. My failures are just as beautiful as my successes. Each day I try to ground myself on this truth: "If you did nothing today, and no one you loved talked to you, you made no money, you did no good deeds, and you simply stayed in bed, you would still be valuable and irreplaceable and worthy. You are one of God's children and you are already enough." And now, I will honor this new adventure at 526 S Main in Downtown Joplin. I'll play and create and trip and make mistakes, but I'll honor every moment of it and every beautiful lesson I learn along the way. I hope you'll honor your minutes and days and failures, too. You are not a nuisance. Every moment of your life means something, is worth something, and is building something. The highest of highs, lowest of lows, and, more often, the mundane everyday that somehow turns into years - it's all necessary. Honoring each breath of your precious life in turn honors yourself. And you are absolutely worth that. Reach out here and we'll reply with our Portrait Guide. BIG NEWS. We now have a gorgeous studio in downtown Joplin! (Those windows, right?! And there are four more! It’s heavenly.) We are working hard to get it ready for you to come see during the Third Thursday art walk on May 17, and want to thank each one of you: our clients, friends, supporters, and cheerleaders. I also want to thank Jordan, since we've seen nothing but growth in our business since he joined me full time, and because he is wonderful and creative and I couldn't do this without him. Oh - and the same month we get this studio happens to be the same month Mitzi Starkweather Photography celebrates 5 years! Wow. For once, I don’t know what to say. I think I’ll just take a deep breath and be grateful for now. My long-time assistant and muse Jerica and I broke in the studio last week, and I'm so thrilled to share those portraits with you now. But above all, I am grateful. 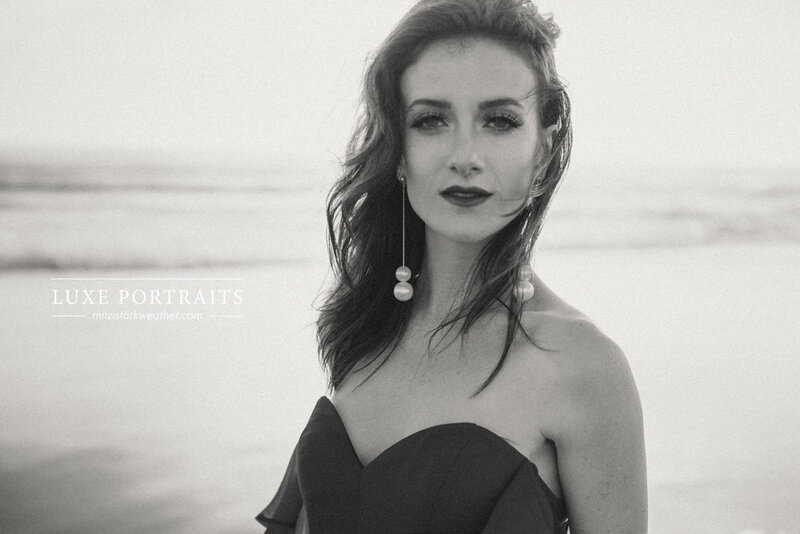 While we are fully booked for the month of May, we have two spots left for our Oregon Coast shoots in June, and three studio (!!) shoots left for June. We are accepting bookings throughout 2018 and popular dates go fast, so reach out at www.mitzistarkweather.com/luxe-portraits if you'd like to get more information! "I look at these portraits, and I see myself. It's the real me." It starts with an email or a phone call. And usually, before I've even met you, I know your desires and fears. So we talk about your dream photoshoot, we plan your outfits, and we book date and the makeup artist. When you return for your shoot, you bring armfuls of clothes. As they tend to do, a hundred things come up the morning of your shoot - a flat tire, a sick child, a crisis at work - but you make it here. And you take a big sigh of relief. And then the transformation begins. The hair and makeup artist styles you beautifully, and you look in the mirror - you start to believe you're beautiful! And then we choose a dress for you to wear. We walk into the studio, and I can feel your nervousness. I tell you, "You've got this.". Then, for each portrait, I pose you down to the fingertips and coach you on your facial expression. I make sure the assistant holds the fan to perfectly caress the right locks of hair, I smooth out the wrinkles in the fabric of your dress, I tell you to take a deep breath. And suddenly, we create a portrait. When you see the portrait, you say things like, "I look beautiful. That's ME." You say, "For the first time, I feel like I am SEEING myself." You say, "You know how your mother always tells you you're beautiful and you believe it but don't see it yourself? Well today, I saw it." And that is the posing paradox. We planned and styled and made you up, we told you how to stand and where to push your shoulder and how to relax your jaw. We set you up in the perfect environment for your YOU to come alive. And even though nothing about "you" in this moment is "every-day" or "natural," you are somehow the most beautiful and true version of yourself. And that's why it worked. We convinced you that you could do this - be in front of the camera and then love the portraits. It's the same reason why telling someone to "act natural" in front of the camera results in painfully awkward reactions. We need boundaries. They allow us to thrive and create! And when you tell me you see "you," I see you light up. And I'm so grateful that you honored yourself and believed it could happen. 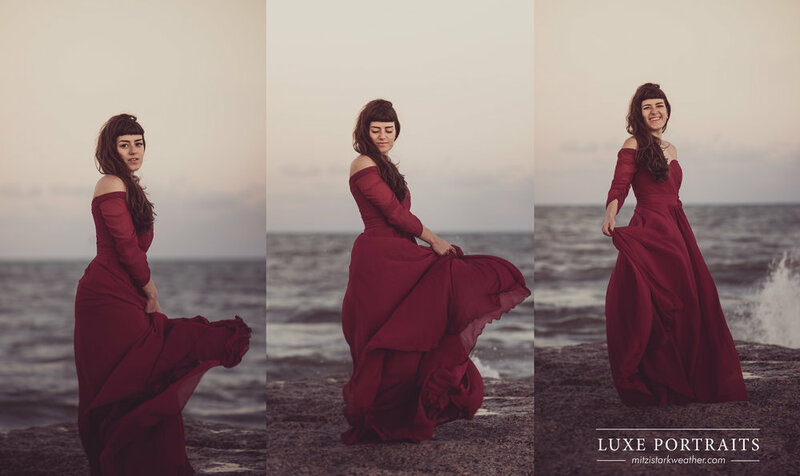 Ready to start planning your Luxe Portrait experience? 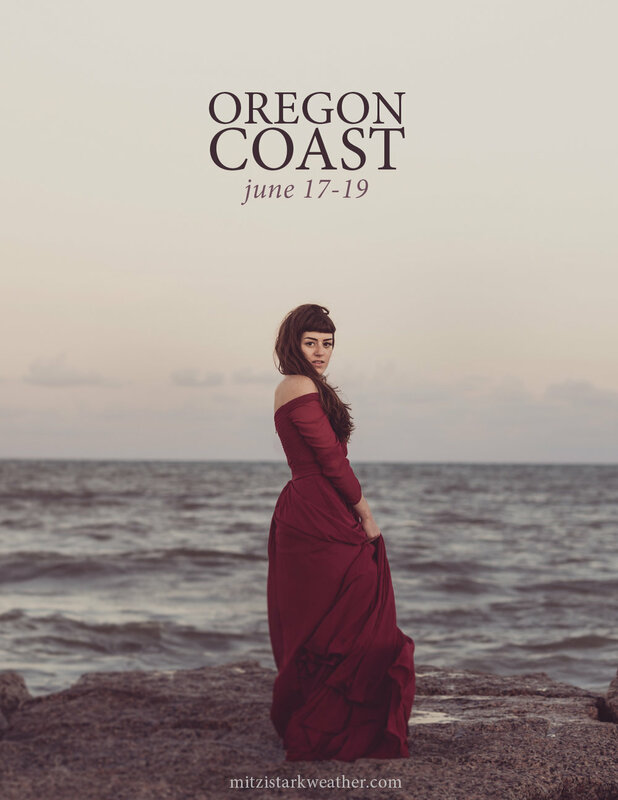 We have five sessions available until July in our Joplin studio, and three sessions available on the beautiful Oregon Coast June 17-19! Contact Mitzi here to receive the Luxe Portrait Guide and start planning. Why is the Camera Scary? Making jokes. Laughing out loud and then shaking the head. Breaking into a sprint. Ducking behind someone taller. Screaming "no" the way you scream it when someone tells you to get rid of the spider in the room. What do these reactions have in common? They are all responses I get from people when I suggest they have their picture taken. So why is the camera so scary? Have we ever really asked ourselves this? It's just a little lens attached to a light sensitive machine that captures whatever light and shadow it sees. It's harmless. Let's jump right on in. Has someone ever criticized your appearance? Yeah, me too. It's bad enough when they're someone you barely know, but it's worse when they're someone you love. And what about you - what did you tell yourself when you looked in the mirror today? Did you compare yourself to the celebrities you just saw on your favorite show or the friends you follow on social media? You probably did. And I bet you weren't even aware of it. Here's a new belief I dare you to try: "People who have criticized my appearance were simply showing me they're not happy with their own. When I compare myself to others, I lose sight of the magnificent beauty I possess because I compare apples to oranges. Instead, I want to believe that I am worthy of a portrait simply because I am a unique and wonderfully made human being." And if you scoffed at that last sentence or thought it was cheesy, I want to give you a hug right now. I'm sorry that you've been hurt and its made you cynical - I have been too. I'm sorry that people have taken their insecurities out on you and made you hate the way you look. But you know what? Today is new. Today you can choose to believe whatever you want. Try giving yourself a chance. 2. "I NEED TO LOSE FIVE POUNDS"
"I need to lose five pounds" = "I'm not good enough yet." But you are. You are magnificent the way you are right now. (Even if you think you're "too skinny," which is another excuse I hear.) And if you weigh 400 pounds through your 20's and then 200 pounds through your 30's, aren't both eras of your life worth remembering and celebrating? Weight and age are numbers. The only reason we don't say, "I need to lose five years" is because it isn't possible. But we do say "I'm too old," and it comes from the same core belief. Also, as your portrait photographer, it is my job to advise you on clothing and then light and pose you in such a way that is as flattering as possible! I take this seriously, and I promise it will give you confidence. Your legacy is worthy preserving and celebrating regardless of how much physical space you occupy. I got this email from a client last week: "I wanted you to know how you have helped me to not be so critical of myself in pictures that I have no control over. There are always going to be those unflattering pictures out there, but I have to remind myself that that’s not me. I have your photos to reflect upon and feel amazing about myself." It never ceases to amaze me how often I am surprised after meeting a client in person when all I had seen before was a couple snapshots of them on Facebook. They always seem more attractive in person! And isn't that a portrait photographer's job? To see the way each person uniquely lights up and capture the very best version of them. Maybe you had a bad experience with a professional photographer. If that happened, don't hide from the camera forever. Find someone you trust who cares about who you are and wants to do all they can to create a portrait you'll be proud of. Some of us are selfie masters but shudder at the thought of handing someone else the reigns. It's terrifying - I get it! And while there's nothing wrong with a good selfie, it's important to hand over control to a professional who will capture who you really are, along with your interactions with loved ones. Selfies are fun but they're not a Portrait. And if you have a difficult time giving up control, interview your potential photographer first! Ask to see their portfolio (with more than just the 20 year olds who look like models), and look for Before and After images. I do a consultation with all of my clients before they even book the shoot so they can talk with me and get a feel for everything before they commit! And on a personal note, I finally scheduled a photoshoot with a photographer I've known and trusted for a long time. The shoot is in a couple weeks, and I have butterflies! But do you know why I'm not afraid? Because I know the photographers, have seen their work, have met with them to plan the shoot, and trust them to do an incredible job. It's easy to think, "Well what if the photographer doesn't make me look as good as I can in a selfie?" when we should really be thinking, "What if they can make me look even better and show me something new?" This is the tough one, isn't it. Hi, I'm Mitzi, and I'm a recovering self-hatred addict. Why do I say addict? Because you get addicted to things that serve you. Yikes! Here we go! - If I believe I'm not good enough, that means I don't have to try. - If I believe no one will like me, I don't have to be vulnerable and reach out to people. - If I believe I'm bad at this or that skill, it means I don't have to push myself to develop it. - If I believe I am too far gone, it means I don't have to stretch myself out of my comfort zone. - If I believe everyone will treat me negatively, I'll go into every interaction with that expectation and make it true. - If I believe I am worthy of accepting who I am, then I have to be responsible for who I am. Yeah, those are heavy. So here's a question: How do you show the people you love that you actually love them? Do you tell them? Sure. But don't your actions speak louder? The only way to start loving yourself is to start believing you are worth loving. You'll accept whatever you think you deserve - So start expecting the best. One of the most powerful transformations I see within our clients happens because they SHOW UP for themselves. We spend time, money, and energy on the things we love. Who do you love, and what do you give them? Have that list in your mind? Good. Now start doing those things for yourself too. If nothing else, I hope you hear this from my heart to yours: You are worthy of the love you are so eager to give to others. You are worthy. Ready to learn more? Contact Mitzi here. Sound fun? Fill out the contact form here and I'll send you our Portrait Guide with all the details!